The G20 London Summit on 2 April 2009 issued “a global plan for recovery and reform”. G20 leaders have not yet gone far enough on the fundamental changes the world needs. The communiqué appears to have made progress on some critical issues but there were also missed opportunities, especially on building a green economy, and some areas where it moves in the wrong direction. In this paper we assess the outcomes of the London Summit and the UK government’s progress towards the 12 recommendations set out by the Put People First platform in March 2009. Put People First has called for an overhaul of the global economy to deliver jobs, justice, and a safer climate. Put People First wanted explicit recognition that this is not just a banking or a regulation crisis, but a structural crisis of the entire economic model. However, the G20 leaders legitimised and strengthened the existing institutions which have been responsible for overseeing the failed policies. To bring about the overhaul of the global economy that is needed there must be an inclusive international process with the UN, which also needs reform, playing a key role. It is not only about process, the changes need to go to the heart of structural deficiencies in the international financial, economic and governance systems. We appreciate that the UK government conducted extensive dialogue with UK civil society before the summit and look forward to further engagement. We renew our call for the UK government and other countries to seize this opportunity to start building an economy nationally as well as internationally that puts people and planet first. Over the course of 2009, there are several key moments – the UN Conference on the Financial Crisis, the G8 summit, another G20 leaders summit, another G20 finance ministers summit, and the UN Framework Convention on Climate Change (UNFCCC) Copenhagen meeting – in which the UK should provide leadership for reform. We also call on the government to enhance the participation of key stakeholders including international civil society in these processes. While small steps were taken towards some of our original 12 recommendations, not enough has been done. A holistic approach must be taken, not one that focuses on single issues in different venues, so that systemic and global governance issues are not lost in the process. The recommendations we make are an integrated package. Prepare, by the G20 finance ministers meeting in November, a proposal for a truly multilateral and automatic tax information exchange agreement that will benefit developing countries and assist those that need help in developing the capacity to make full use of the information that will be available. Reform regulation in the UK so that all financial firms, markets and products are not just registered, but properly regulated; and ensure that discussions on launching a fully-inclusive multilateral regulatory authority commence at the earliest possible time. Create a green recovery by investing more in green jobs and green industries and ending investment to harmful projects that would lock in high-carbon and other unsustainable infrastructure. Demand an end to the IMF’s practice of forcing damaging pro-cyclical economic policy conditions that will worsen recessions and constrain investment in public services in countries that go to it for loans. Increase funding for nationally-developed comprehensive social protection schemes in developing countries ensuring that they reach the poorest and most vulnerable, including by revising the World Bank’s IDA allocation system and developing innovative sources of finance such as a currency transaction tax. Make sustainability criteria central to investment practice at both national and international level: Regulatory requirements should include reporting of risks incurred by financing carbon-intensive or ecologically damaging business activities. Pension funds and other investors should be incentivised to include environmental, gender and social impacts and governance risks in their business practices. The policies in this paper offer the essential building blocks for undertaking a transformation of the global economic and financial system and should be viewed as an integrated package helping world leaders chart a path out of recession and towards a fairer global economy. We recognise that the UK can not act alone, and welcome the leadership the government has shown so far. Now, we call on the UK government to step up its game, get serious about reform, seize the opportunities that this year presents, work closely and positively with the United Nations, and put its words into action. The London Summit of the G20 on 2 April 2009 issued “a global plan for recovery and reform”. It appears to have made progress on some critical issues but there were also missed opportunities, especially on building a green economy, and causes for real concern in other areas. G20 leaders have not yet gone far enough on the fundamental changes the world needs. The economic and financial crisis raises profound and fundamental questions about the values underpinning our economic and financial system. Ensuring democratic governance, creating a fairer global economy, providing decent jobs and public services, and building a green economy are mutually interdependent. While large sums of money are being provided for bank bailouts and economic stimulus, there is a dearth of action on transformative economic change. Putting people first means taking a holistic approach to addressing the flaws in our economic and financial system. The recommendations we make are therefore an integrated package. 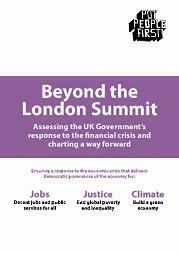 In this paper we assess the outcomes of the London Summit and the UK government’s progress towards the 12 recommendations set out by Put People First in March 2009 as well as amend our recommendations accordingly. Over the course of 2009, there are several key moments – the UN Conference on the Financial Crisis, the G8 Summit, another G20 leaders’ summit – in which the UK needs to provide leadership for reform. We renew our call for the UK government and other countries to seize this opportunity to start building an economy nationally as well as internationally that puts people and planet first. We also call on the government to enhance the participation of key stakeholders including international civil society in these processes. This paper reflects the views of members of the Put People First platform, an unprecedented alliance of a wide spectrum of civil society organisations with millions of members from across the nation. We have called on the UK government to show its commitment to putting people first by signalling an historic break with the failed policies of the past, and starting work on a new system that makes the economy work for people and planet. We appreciate that the UK government conducted extensive dialogue with UK civil society before the London summit and invite them to continue doing so. Put People First has called on governments of the world to overhaul the global economy to promote jobs, justice, and a safer climate. Blind faith in free markets must be replaced with an economic system that works in the interests of people and planet and provides sturdy foundations for future prosperity. Put People First wanted explicit recognition that this is not just a banking or regulation crisis, but a structural crisis of the entire economic model. At the London Summit, the G20 recognised that “a global crisis requires a global solution”, and called for “an open world economy based on market principles, effective regulation, and strong global institutions.” The G20 also committed to ‘not only restore growth, but to lay the foundation for a fair and sustainable world economy.”However, the G20 leaders strengthened the existing institutions which have been responsible for overseeing the failed policies. The UK Prime Minister said “The old Washington consensus on what was necessary for an economy to move forward is now dead. A new consensus has to be built.” There has been recognition that credit-fuelled speculation-based growth is not the way forward, as well as an attempt to bring development and environment issues into discussions at the summit. However, there has been no action yet to address the inherent failures of the economic model, on the contrary there is a continued belief in the UK that liberalised markets are best. To bring about the overhaul of the global economy that is needed there must be an inclusive and transparent international process, with a key role for the UN, which also needs reform, to redesign the international financial architecture. Put People First wanted explicit agreement to launch such a process. The G20 did not recognise that such a process was needed, ignored work from the UN, and made no mention of the upcoming UN Conference on the Financial Crisis that could have been the start of such a process. The UK has said that it views a series of already planned meetings, some of which are not inclusive or involving the UN, as the way to tackle the various issues. These include the G8 Summit in Italy, another G20 leaders meeting in September, a G20 finance ministers and central bankers meeting in November, and the UNFCCC Copenhagen meeting. There has been no support for the UN’s role in negotiating a new global deal, and the UK government is moving ahead on planning G8 and G20 work without a participatory international process. Taking action on the Prime Minister’s statement that we must have a different economic and financial system and that we can not return to business as usual. There should be a clear signal of a break from the past by undertaking a comprehensive reform of our economy, as laid out in this and the previous Put People First paper. Engaging fully and at the highest levels with UN processes for discussing the financial, economic and climate crises and international economic reform and working to convince other countries that the UN, which needs reform, should play a key role in negotiating a new global deal. Recommendation 1: Tackle tax havens, particularly those with strong connections to the UK such as Crown Dependencies and UK overseas territories, by compelling them to abide by strict international rules and participate in systems of automatic exchange of information. The UK can particularly take action on UK crown dependencies and overseas territories, by requiring them to abide by stricter international rules [including the European Savings Tax Directive]. The G20 agreed to “stand ready to deploy sanctions to protect our public finances and financial systems” but there were not enough specifics to that pledge. The Prime Minister has told crown dependencies and overseas territories that they must meet or exceed the OECD guidelines on tax information exchange. He has also encouraged them to sign up to bilateral tax information exchange agreements. To tackle tax havens there needs to be an objectively compiled list of jurisdictions which do not comply with stricter rules than the insufficient ones currently in place, including on transparency of information, as well as sanctions applied against those jurisdictions. The G20 agreement “noted” the OECD list of jurisdictions which do not comply with the international standard for information exchange, but did not mention the need to strengthen the rules, include transparency requirements or develop a multilateral sanctions regime. The Prime Minister has stated his intention to sanction non-complying jurisdictions. The OECD blacklist has now been emptied with no benefit to developing countries, as the OECD guidelines are not sufficient. The UK government has yet to take sanctions against other jurisdictions. To effectively stop tax evasion and avoidance schemes, there must be multilateral systems of automatic information exchange through global multilateral institutions with democratic and participatory governance. The G20 is “committed to developing proposals, by end 2009, to make it easier for developing countries to secure the benefits of a new cooperative tax environment.” The Prime Minister has written to the OECD to explain that the G20 intends for tax information exchange through multilateral systems, but did not mention whether information will be exchanged automatically. The OECD, though multilateral, is not a representative or global multilateral organisation. To date the UK has signed bilateral tax information exchange agreements with a number of territories, but there have so far been no new actions on multilateral information exchange. Recommendation 2: Insist on fundamental governance reform of the World Bank and IMF, to ensure that they are properly democratised, and made fully transparent and accountable, and respect international standards on human rights, the environment and labour. A key indicator of commitment to IMF governance reform would be to accept the recommendation of the eminent person committee on governance reform, that the governance reform of the IMF should be re-opened immediately a new round of reforms agreed within a year (by April 2010). The G20 agreed “that emerging and developing economies, including the poorest, must have greater voice and representation” and that the IMF should “complete the next review of quotas by January 2011.” While recognising that IMF governance needs to be reformed, the UK government has resisted accelerating reform faster than January 2011. To make the IFIs fully accountable, the World Bank and IMF must introduce a presumption of disclosure for all documents with limited exemptions, as well as publishing draft documents, board transcripts and full information about the terms of loans/investments. The G20 communiqué made no specific reference to reforms to make the IFIs more transparent and accountable. The UK government has expressed support for increased transparency and disclosure, but supports a broad exclusion list including of documents related to decision making in the IFIs. We have no knowledge of UK action in demanding increased transparency at the IFIs because discussions take place behind closed doors. The IFIs must respect legally-binding international standards on human rights, the environment and labour rights – for example the ILO core labour standards, and the requirement for free, prior and informed consent of Indigenous Peoples – as well as putting in place/recognising independent international enforcement mechanisms. The G20 “agreed on the desirability of a new global consensus on the key values and principles that will promote sustainable economic activity. We support discussion on such a charter for sustainable economic activity with a view to further discussion at our next meeting.” However, there was no mention of existing international standards. The UK has expressed support for the IFIs being subject to some existing standards, notably the ILO’s core labour standards, but not declarations on human rights. We have no knowledge of UK action in demanding the respect of international standards at the IFIs because, again, discussions take place behind closed doors. Recommendation 3: Make all financial institutions, financial products and multinational companies transparent and publicly accountable. This will include removing the shadow banking system through proper regulation, introducing country-by-country international accounting standards, and making governance and social and environmental impacts part of listing and reporting requirements for multinationals. All financial actors and markets must be properly regulated. The G20 agreed that only “systemically important” institutions will be regulated. The Prime Minister asked: “But how much safer would everybody’s savings be if the whole world finally came together to outlaw shadow banking systems?” In terms of action, the FSA has not yet set out its detailed plans for a regulation overhaul, but it is understood that the UK was instrumental in ensuring that the as-yet-undefined words “systemically important” appeared in the G20 communiqué. To eliminate secrecy and crack down on corporate tax avoidance and tax evasion schemes, there must a requirement for multinational companies to produce country-by-country accounts, which can be accomplished through enforceable international standards. The G20 committed to “achieve a single set of high-quality global accounting standards” with no mention of country-by-country reporting. UK ministers have said that they are studying this idea “vigorously” and have supported a less robust version of its application in the extractive industries, whereby increased disclosure of payments by companies is encouraged. The UK has not yet taken action on country-by-country reporting standards outside of the context of the extractive industries transparency initiative. To ensure coherence between social (including health and education), environmental and economic policy, environmental, gender and social impacts must be part of listing and reporting requirements for multinationals. The UN has led the development of such reporting standards yet the G20 made no mention of expanding reporting and listing requirements to include social, gender and environmental impact. The 2006 UK Companies Act includes limited provisions for this for UK companies, but the UK government has not engaged with expanding the requirements, nor extending any such requirements internationally. Insist that new international accounting standards include a provision for country-by-country reporting of all accounts information for all multinational companies. Publicly push for reforms of the governance of the World Bank and the IMF to be completed ahead of schedule – ensuring that developing countries and developed countries have parity of voice and vote at the Bank, and that the IMF institutes a double majority decision making system for all decisions. This year there must be a fundamental shift in the transparency and accountability of these institutions so that they operate under a presumption of disclosure and provide opportunities for the meaningful participation of all stakeholders in their decision-making processes. Demand reforms of the newly created Financial Stability Board (FSB) so that it meets modern standards of governance, transparency and accountability. The same should be done for financial and accounting standard setting bodies so that all the stakeholder groups that they serve – including governments, suppliers, employees and citizens – can effectively influence their decision making. Insist on new accountability mechanisms at the World Bank and IMF to ensure that they respect international standards on human rights, the environment and labour rights – for example the ILO core labour standards. Engage fully, openly and transparently in the discussions on a charter for sustainable economic activity, ensuring that it reflects environmental sustainability and that it includes a binding requirement that environmental, gender and social impacts must be part of listing and reporting requirements for multinationals in all countries. Recommendation 4: Ensure a massive investment in transformative action to deliver a low-carbon economy and push other developed countries to do the same. A green new deal is needed to create jobs based on decent work and pay through alternative energy development, sustainable transport systems, and energy saving and conservation. This shift to a low-carbon economy must be a ‘just transition’ based on democratic involvement of those groups most affected by that shift. G20 countries should commit to a green new deal, meaning investing at least 0.8% of GDP per annum during the fiscal stimulus period in additional climate change measures, low-carbon development and green jobs in areas like sustainable transport, energy efficiency and renewable energy programmes. This equates to around 40-50% of a stimulus worth 3.5-4% of GDP spread over two years. The G20 communiqué contains only a general commitment to ‘best possible use’ of fiscal stimulus towards a green recovery, without specifics, metrics or a timetable. The UK government was a vocal advocate of green stimuli in the run up to the G20: “There is a clear case for driving a global economic transition that is stable and sustainable … To set the world on the path to a low-carbon future we must seize this opportunity to make the long-term investments – economic, scientific and technological – that are required and generate green jobs as a means towards green growth.”1 The Pre-Budget Report of November 2008 included a £20 billion stimulus (1.4% of GDP) and a further £10 billion was announced in January. About 60% of the initial stimulus was a cut in VAT. Green measures preceeding the April budget totalled £2.1 billion, or 0.15% of GDP – just 7% of the overall package.2 The April budget took some limited additional steps to stimulate energy efficiency and renewables. Recommendation 5: Invest in and strengthen public provision of essential services to meet universal human rights, including by massively increasing public investment in ecologically sustainable social housing. Governments need to invest in public services to meet growing social needs and support inclusive economic development, especially during an economic downturn. The G20 communiqué affirms the importance of social protection and investment in education and training for a fair and sustainable recovery. In the UK, the government has expressed support for strengthened public services. However, some public sector bodies are making redundancies, vital services such as social care are seriously underfunded and drastic spending cuts have been proposed for future years to close the fiscal deficits created by the current crisis. Through the IMF, the UK has supported drastic public sector spending cuts in countries that have approached the Fund for crisis financing. Governments must also develop policies to strengthen public provision, rather than pursue privatisation and volatile private finance arrangements, so that essential services can serve as a resilient safety net and effective economic stabiliser. The G20 did not address the question of privatisation. The UK government has shown no sign of rethinking its ongoing marketisation of public services and has even used public money to bail out PFI schemes that could have been better delivered by direct public investment. Massive investment in affordable and ecologically sustainable social housing is needed to support job creation, meet social need and address some of the root causes of the current crisis. In the UK, the government should build 100,000 new social homes over the next two years. The G20 did not address the need for public housing. The UK government has recognised that there is a growing housing need. The government’s commitment of £1 billion towards social housing measures in its April budget was a step in the right direction, but far from sufficient to meet housebuilding targets and prevent historic rises in social housing waiting lists and numbers of people in inadequate housing. Recommendation 6: Work to ensure sufficient emergency funding to all countries that need it to enable them to stimulate their economies, protect jobs and provide social protection, without damaging conditionality attached. If massive new resources are made available to developing countries through the IMF they must be given without economic policy conditionality attached. New resources committed by the G20 will be made available both through the new Flexible Credit Line and through existing IMF lending schemes which have heavy conditionalities attached. The problems with IMF conditionality were not mentioned in G20 communiqué. The UK government committed to end all economic policy conditionality in its bilateral assistance in 2005, but still accepts their use in multilateral support. The UK Treasury, which has responsibility for the IMF, has defended the IMF’s use of pro-cyclical economic policy conditions that worsen recessions in crisis programmes at the same time as pursuing counter-cyclical policies to counteract the recession at home. As the crisis was not created in developing countries, funding to alleviate the crisis should preferentially be given as grants and not loans. The G20 financial commitment to developing countries contains no new aid commitments, and for resources delivered through the IFIs, there are no grants. There was a commitment to concessional lending through the IMF and SDR creation, but these are not grants. So far the UK’s bilateral commitments for emergency relief has only been £250 million through the Rapid Social Response Fund, a component of the World Bank’s Vulnerability Financing Facility, which does not provide any new grants but merely frontloads existing resources and concessional loans. To counteract the effect of the crisis on the poor, social protection schemes in developing countries must be fully funded on the basis of need. The G20 communiqué says: “The actions and decisions we have taken today will provide $50 billion to support social protection, boost trade and safeguard development in low income countries”, but there is no clear commitment on how much of the $50 billion will be earmarked for social protection. It is not clear where this money is coming from, whether it will all be channelled via the IMF and how much the UK provides out of that. DFID has said that it is working to ensure that the poor get sufficient funding and that it is prioritising social protection. As noted above, the UK has promised $250 million for the Rapid Social Response Fund of the World Bank – disappointingly small and not additional to its existing aid budget. Emergency funding for poor countries must be balanced between spending on infrastructure and social spending. There is no balance discussed in the G20 communiqué. The UK has not expressed a specific position on balance, but DFID has said it is prioritising social protection in its crisis response. Immediately revise the fiscal and tax measures in the budget to launch a green new deal and create a green recovery by investing 40-50% of the fiscal stimulus in green jobs and green industries, including sustainable transport, energy efficiency and renewable energy programmes; ending investment in harmful projects that would lock in high-carbon infrastructure; and stimulating private-sector green investments. Invest immediately in building at least 100,000 new environmentally sustainable social homes within 2 years and retro-fitting the entire existing stock of social housing to improve its energy efficiency. This will mean giving local authorities the powers and resources they need to step up council house-building programmes as well as providing additional support to Housing Associations. Work under the principle of ‘just transition’ in the creation of a low-carbon economy so that high carbon jobs can be made greener or replaced by low/no carbon jobs and working people are not forced to choose between their livelihood and the environment. The government should also demand this to be included in all international agreements on climate change. Increase funding for nationally-developed comprehensive social protection schemes in developing countries ensuring that they reach the poorest and most vulnerable, including by revising the World Bank’s IDA allocation system so that it incorporates need as a factor and developing innovative sources of finance such as a currency transaction tax. Demand that international institutions such as the EU, World Bank and WTO end the imposition of liberalisation and privatisation models at a global level, as we have seen with the European services directive and the promotion of PPPs in developing countries. Take a leadership role at upcoming meetings on UN, G8, EU and G20 level to push other countries to provide sufficient grant-based resources for developing countries . Demand an end to the IMF’s practice of forcing damaging economic policy conditions that will worsen recessions and constrain investment in public services on countries that go to it for stand-by agreements and poverty reduction and growth facility loans. Recommendation 7: Honour the commitment to deliver 0.7% of national income as aid by 2013 at the latest, deliver it more effectively and push for the auditing and cancellation of all illegitimate and unpayable developing country debts. Rich countries must honour the international commitment to deliver 0.7% of national income in aid. The UK is on track to honour its commitment on aid and has been instrumental in ensuring that the final communiqué reaffirmed existing aid commitments. The Prime Minister has been very public in saying that the UK will not abandon its commitment to developing countries. The budget released in end April fully met the commitments at Gleneagles and in the spending review to ramp up aid volumes towards the 0.7% target. There must be an agreement to establish a fair and transparent international arbitration mechanism for dealing with sovereign debt. The G20 communiqué does not mention debt arbitration. To date, the UK does not consider this a priority and has taken no action on it. There must be efforts to expand and deepen debt relief, including by cancelling all illegitimate and unpayable developing country debts. The G20 reaffirmed historic commitments to debt relief but not to expanded relief. The UK has called for expanded debt relief for many years, but shies away from leading on this internationally anymore. The UK has not recognised the argument on illegitimate debt. The UK has cancelled most of its low income country aid debts but still has large amounts of export credit debt on its books. Recommendation 8: Ensure that poorer states are allowed to take responsibility for managing their economies. In particular, they may need to control cross-border capital flows, and should not be penalised or discouraged from doing so. There must be recognition that capital controls and other tools for managing cross-border capital flows should be available in all developing countries. The G20 did not recognise this and said “We will not retreat into financial protectionism, particularly measures that constrain worldwide capital flows, especially to developing countries.” The UK has never recognised the usefulness of capital controls, and has instead argued for open capital markets. There should be an agreement to implement a currency transactions tax as a mechanism to reduce speculation and raise revenues for development programmes. The G20 did not engage with this idea. The Treasury has rejected the use of a currency transactions tax but other officials have avoided expressing support or opposition to this proposal, often pointing at the Treasury as the place where a decision would have to be made. No action has been taken. Recommendation 9: Stop pushing developing countries to liberalise and deregulate their financial services industries, alongside industrial, agricultural and wider service sectors, via the WTO or EU regional and bilateral trade negotiations. There should be no attempt to rush through a conclusion to the WTO Doha Round – a deal that developing countries have rejected several times due to concerns at the potential impact on their economies. There should be no attempt to rush through a conclusion to the WTO Doha round. The communiqué stated that the G20 was “committed to reaching an ambitious and balanced conclusion to the Doha Development Round, which is urgently needed.” The UK still calls for a quick conclusion to the round. There is no evidence that it is happening quickly, but also no evidence that due consideration has been given to the concerns of developing countries in maintaining policy space around sensitive economic sectors crucial to the livelihoods of poor people. Given its role in causing and spreading the financial crisis, rich countries should stop pushing for financial services liberalisation and deregulation in bilateral trade and investment agreements. The G20 did not engage with this. The UK has made no such commitment, but a junior minister said that he would be willing to look at any evidence sent to him about problems with financial services liberalisation. As part of the EU, the UK continues to include financial services liberalisation clauses in the economic partnership agreements and regional trade agreements being negotiated. Leverage the UK’s leading position on aid to ensure that other donor countries do not abandon their aid commitments in these challenging times. At the 2009 G8 Summit, G8 leaders need to reaffirm their promises from Gleneagles to increase aid by $50 billion a year by 2010 and double aid to Africa and agree binding timetables to achieve that as well as a mechanism for monitoring progress against promises. Take a lead internationally in establishing a fair and transparent international debt arbitration mechanism to deal with sovereign debt workouts; cancelling remaining unpayable debts; and auditing debts owed to the UK with a view to cancelling those deemed illegitimate due to irresponsible lending. Ensure that reference to this arbitration mechanism is included in the discussion on the charter for sustainable economic activity. Institute a currency transactions tax on sterling to help raise resources for developing countries to counter the effects of the crisis and invest in economic development, including social protection and public services; and examine other sources of innovative finance. Recognise that open capital markets are not always positive, especially for developing countries, and ensure that the IMF begins delivering sound advice to developing countries as to how that can institute appropriate and effective capital controls. Immediately cease all bilateral and regional negotiations with developing countries that would create further financial services liberalisation, and begin rolling back existing agreements that prematurely pushed financial services liberalisation. Recommendation 10: In addition to ensuring a massive investment in transformative action to deliver a low-carbon economy (recommendation 4), create robust regulatory requirements and financial incentives at national level and push for them at international level to create a green economy. Regulatory reforms should promote environmental sustainability and tackle climate change by incentivising the transition to a sustainable low-carbon economy. Regulatory reform is required to ensure that environmental services are fully valued to avoid short-term profit being prioritised ahead of long-term sustainability. In their statement on the objectives of regulatory reform, the G20 countries do not mention environmental sustainability or the need to tackle climate change, one of the greatest dangers to the global financial and economic system as well as social and environmental goals. The UK government has to date been reticent in acknowledging the key role that the financial system has in facilitating the transition to a sustainable low-carbon economy, and its own objectives for regulatory reform at both national and international levels are therefore also lacking this key dimension. Recommendation 11: Demonstrate global leadership by pushing for a fair and adequate global deal at Copenhagen to agree substantial, verifiable cuts in greenhouse gases, with rich countries leading the effort, which will limit global average temperature increases to well below 2°C. G20 countries should demonstrate commitment to comply with the emissions cuts demanded by the existing Kyoto commitment period and state their determination to reach a fair and adequate global deal commensurate with the 2°C goal. The G20 countries in the communiqué committed to tackle climate change and reach agreement in Copenhagen with no further reference in the document to climate change and no specific commitments to meet the existing Kyoto targets or secure new deep emissions reductions. There has not been a commitment by the G20 countries to limit global average temperature increases to well below 2°C on pre-industrial levels, nor has there been a commitment by rich countries to take the lead in cutting emissions at the levels necessary to achieve this target (at least 40% on 1990 levels by 2020). The UK is on track to meet and surpass its Kyoto target, but only in part though shift in production from the UK to predominantly non-Annex 1 countries. The government has made a legally binding commitment to a 26% reduction in emissions on 1990 levels by 2020 in the 2008 Climate Change Act and has recently pledged in pending legislation to deepen the emissions cuts to 34% by 2020. A clear strategy for achieving these targets will be published in the summer, however the UK government continues to under invest in green infrastructure and green jobs and has yet to make a major shift towards low or no carbon forms of transport and energy. Recommendation 12: Commit to sufficient, substantial, verifiable new resource transfer from North to South, additional to ODA, to support resilient adaptation and sustainable development in poor countries. G20 countries should commit that they will not pursue the development of governance mechanisms for the disbursement of climate change financing outside the UNFCCC. The G20 countries have not yet made such a commitment. The G20 communiqué seeks to strengthen the institutions which risk undermining the UNFCCC and the UK government continues to invest real resources and political capital in building capacity and structures, such as the World Bank Climate Investment Funds and other pilot programmes, to deliver climate finance outside the UNFCCC system. Rich countries in the G20 should meet their obligations to fund climate change adaptation and mitigation for developing countries with resources that are additional to existing ODA commitments. There is no mention of funding for climate change adaptation or mitigation in the G20 communiqué, nor any commitment to supporting sustainable development in developing countries beyond ODA commitments. As of February 2009, less than 5% of funds already pledged by rich countries for climate adaptation have been transferred to vulnerable countries. The UK has committed to meet its obligations and on 28 March in a meeting with civil society, Secretary of State for Energy and Climate Change Ed Miliband said the UK supports the additionality of funding to ODA. Make sustainability criteria central to investment practice (for example, by compulsory carbon reporting) at both national and international level: Regulatory requirements should include reporting of risks incurred by financing carbon-intensive or ecologically damaging business activities. Pension funds and other investors should be incentivised to include environmental, gender and social impacts and governance risks in their business practices. Commit to reducing emissions to levels that will ensure that global temperature increases stay well below 2°C. Current science demonstrates that this will require a peak in global emissions well before 2020. For developed countries this means an aggregate cut of at least 40% by 2020 from 1990 levels. The UK should commit that at least three-quarters of its fair share of these reductions comes from cuts in domestic emissions. Ensure that a global climate deal provides adequate mechanisms to recognise and address the responsibilities of developed countries with respect to the impact of our consumption. Provide clear commitment to a support package for adaptation and mitigation in developing countries, by which adequate finance, technology and capacity building support is provided by developed countries in a timely fashion. Total developed country finance should be at least €110 billion each year by 2020 and the UK should honour its commitment to make this additional to existing ODA commitments. Make a clear statement that the UK insists that the governance mechanism for climate finance will be made fully accountable to the UNFCCC. The recommendations in this paper offer the essential building blocks for undertaking a transformation in the global economic system and should be viewed as an integrated package to help world leaders chart a path that simultaneously addresses the climate and economic crises and leads the world out of recession. Decent work, social justice, women’s rights, public services, economic development, environmental sustainability, climate justice, and national and international governance are inextricably linked. The G20 leaders and the UK government have not yet demonstrated that they understand and accept that this is a structural crisis. Actions must follow words, and governments must rapidly rediscover an active role in delivering an economy that is fair and just and that lives within its environmental means. The UK government missed a chance at the London Summit to put issues of fundamental economic reform at the centre of the agenda. We urge the government not to miss the chance again. This year there is a string of occasions – from the UN Conference on the Financial Crisis in June through to the G20 finance ministers and central bankers’ summit in November and the Copenhagen climate negotiations in December – that will be critical to launching the kind of transformative change that is needed. The organisations that make up the Put People First platform represent millions of people across Britain who back the call for a system that puts people and planet before profit. They want an economic system that delivers decent jobs and public services for all, eradicates global poverty and inequality, and builds a green economy to avoid the worst impacts of climate change. We call on the UK government to step up its game, get serious about reform, seize the opportunities that this year presents, work closely and positively with the United Nations and put its words into action.